Cilantro is from the leaves of the coriander plant; cilantro has a strong health supporting reputation and is high on the list of healing spices. All over the world the effects of cilantro are known; in parts of Europe cilantro is known as the anit-diabetic plant while in India cilantro has been used for years for its anti-inflammatory properties. 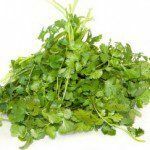 A Moroccan study found that when given cilantro to hyperglycemic patients as a single oral dose for 30 days that cilantro allowed the body to return to normal blood sugars 6 hours post –dose (Gettleman). This study also found that cilantro decreased several factors of metabolic syndrome as well as atherosclerosis indicators and increased cardioprotective factors. It is for this reason that researchers believe that cilantro may protect the cardiovascular system; however, further research is needed. Cilantro contains a large amount of quercetin which is a flavonoid that is not naturally found in the body. Because of this, quercetin has to be obtained through food sources such as cilantro. Queretin prevents LDL oxidation which leads to the development of plaques that stick to the arterial walls which cause them to narrow. The narrowing of the arteries increases the chances of developing a heart attack. Because of this property of quercetin, consuming cilantro can help to reduce the risk of heart attack, stroke, damage to artery walls, high blood pressure and the narrowing of the arteries (Gettleman). When consumed as a tea, cilantro has a detoxifying effect of the body. Cilantro removes harmful metals from the body which is an important aspect to a healthy lifestyle because toxic agents like heavy metals have been found to be associated with a wide variety of health issues (Gettleman). There are no known side effects of cilantro. The coriander seeds are not commonly an allergenic food and do not contain measurable amounts of oxalates or purines (Health Benfits). Gettleman, Robin. “Time to Celebrate Cilantro.” . Life Extension Retail, 02/2012. Web. 25 Jun 2012. Health Benefits. the world’s healthiest foods, 2001. Web. 25 Jun 2012.